Lynn Chadwick is one of the giants of twentieth century sculpture. His work spans fifty years and includes over a thousand pieces. 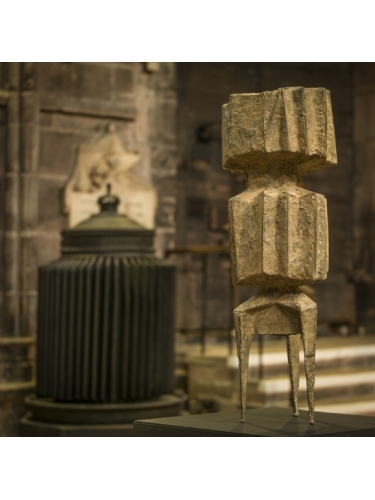 He first came to prominence as one of the twelve semi-finalists for the Unknown Political Prisoner International Sculpture Competition in 1953 and he went on to win the International Prize for Sculpture at the 1956 Venice Biennale. Many honours and awards followed and Chadwick’s work is a cornerstone of all major international art collections. In Autumn 2003 a retrospective exhibition of his work was held at Tate Britain, London. An early training as an architectural draughtsman together with his practical skills in welding gave him the basis for his individual approach to sculpture. His work was constructed from welded iron rods to form an exoskeleton which delineates the planes and establishes the stance of the piece. With this unique and singular language he evolved a range of his own archetypal figures and beasts. Throughout a long and distinguished career Chadwick’s work kept a relevance and individuality. More sculpture, prints and drawings by Lynn Chadwick are available - please contact the gallery.